Living in New Zealand I am very fortunate to be so close to the picture perfect Pacific Islands. When I picture my dream holiday I think of somewhere warm with a beautiful beach and clear water. Being able to get this dream holiday just a few hours flight away is pretty special. If you are thinking about traveling to the islands I highly recommend you do! However deciding which Pacific Island to visit can sometimes be a bit overwhelming! Even though they may seem similar, trust me they aren't. Each island is unique is one way or another and I have my reasons for traveling to each one of them. Fiji is one of the more touristy of the islands, which means it gets very busy! If you can, try and avoid the Australia and New Zealand school holidays when planning your trip here. Prices will usually be a bit cheaper outside of the holidays as well. Fiji is also quite commercialised and if you want a true island holiday on the picture perfect islands you'll need to travel out to one of the smaller islands which can drive prices and travel time up. You want to keep yourself busy with activities and day trips. When deciding what activities you want to fill your day with you will not run out of things to do in Fiji. Many of the resorts offer motorised and non-motorised toys for you to play with (some resorts charge extra). In Fiji there are lots of accommodation options. 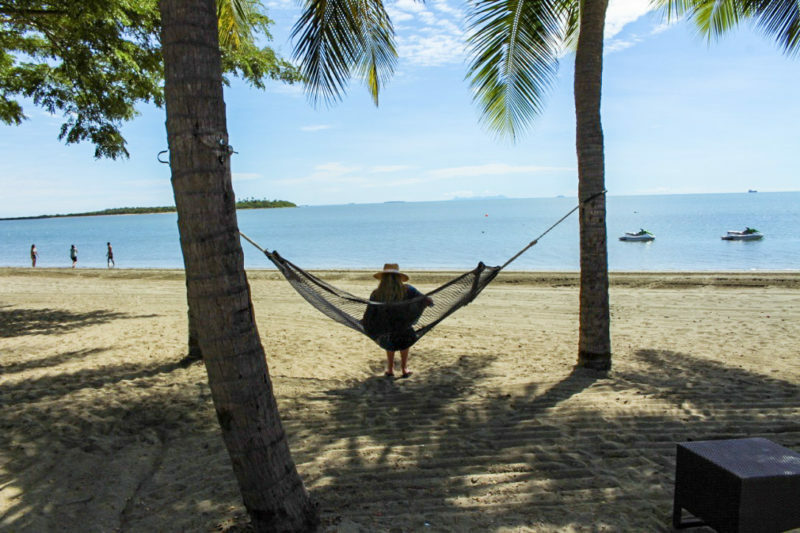 You are spoilt for choice when it comes to luxury resorts, most of which you will find located in Denarau Island or for a more romantic escape head out to one of the smaller islands. You will land in Nadi Airport so a boat will need to take you out to these smaller islands. If you are staying in the Coral Coast or Denarau Island these are accessible by car. If you would like to read more about my experience of staying in Denarau Island read my blog post here. There is no denying that Samoa is simply beautiful. The beaches are some of the best I have ever seen and there is so much to explore. Out of the three islands Samoa is the least established which can be really nice if you are looking to escape reality. Don't expect big flash resorts like you get in Fiji. Yes there are nice resorts but they are very expensive and there isn't too many of them. You want to explore the islands natural attractions such as the To Sua Trench, Papetee Sliding Rocks and stunning waterfalls. The beautiful beaches will also take your breath away. Samoa is stunning, there is so much beauty to be seen both in Savaii and Upolu. I loved this island and renting out a car most days allowed me to see as much of it as I possibly could in the time I was there. The highlight of this trip was seeing the famous To Sua Trench, you can read more about my experience here. During my time in Samoa we spent half of our time staying in a beach fale. We wanted cheap accomodation and it seemed like the perfect opportunity to go back to basics and see how the locals live. You can stay in anything from very basic with no fan to a more 'non-traditional' beach fale. Despite it's small size Rarotonga is very well established and there are plenty of accommodation options. There isn't a lot to do but it is so stunning you could lie on the beach all day taking in the beauty. I've been to Rarotonga twice and I'm planning to go for a third time next year. There's something about this island and the lovely locals that keeps you wanting more. My Dad is even considering moving here and ditching the city life! You love to relax by the beach all day. There isn't a lot to see and do in Rarotonga, there aren't a lot of natural attractions like Samoa or tourist activities like Fiji. Travel here if you really want to relax and are in need of a good break. The local are lovely and there are some great places to eat but it is a very small place. You can drive around the island in about 45min and last time I was there they only had one set of traffic lights. You will really be on island time in Rarotonga! I travelled here with my family and we rented a house which is perfect if you want to escape the busy resorts. However if a resort is more your style there are definitely plenty of options. I would recommend staying in Muri beach. It's quite central so you can walk along the beach and choose different places to go eat. You can also snorkel straight off the beach and if you feel more active there are kayaks to rent. All of the islands are gorgeous and no matter which one you choose you aren't really going to go wrong. It just depends what you want out of your holiday. For pure relaxation go to Rarotonga, for adventure and luxury accommodation go to Fiji and for amazing natural attractions go to Samoa. Hope you consider the islands for your next trip! They are certainly one of my favourite places to travel to!